On The Fly with artist, Noelle Dass. The painted world of Noelle Dass is filled with whimsy, wonder, and wisdom. Influenced by greats Dr. Seuss, and Gary Larson, there is a joyous abandon and sense of adventure in her work that (from the first time I saw it) makes me smile. After meeting Noelle, it was easy to see where all of that comes from. Soft spoken, intelligent, fearless, and utterly charming, Noelle is everything you’d want or expect from her paintings, and so much more. Keep reading to learn more about artist, Noelle Dass. SnS: Hello Noelle! Thanks for interviewing with me today. Let’s start off with some background information. Are you native to the PNW? Noelle: I’ve lived in the Pacific Northwest for 22 years, but I was born in New York and raised in Vermont. I lived there until approximately age 12, when my family moved to Arizona so my mother could earn her MSW. I moved to the PNW to finish college at the University of Washington. SnS: I’d say you are naturalized by now. 😉 How long have you been an artist? Noelle: I think it’s safe to say I’ve been drawing and painting since I could hold a pencil / brush, so probably since the age of three. Art was my favorite subject in school, and I studied art for four years in college. I’ve been a professional artist (earning my living with art) since 2004. SnS: That is an accomplishment! Did or do you have a job (or hobby) outside of art? Noelle: Up until now I’ve been so busy doing the art show circuit that I haven’t had time for much else, but I’m hoping to cut back on art shows next year so I can have a little more of a personal life. For hobbies, I love to read, run, hike, camp, walk my dog Ellie, and volunteer. SnS: What kind of dog is Ellie? Noelle: She is a Goldendoodle – half golden retriever and half poodle. She’s still young and full of love and energy. I also have two cats: Sadie and Kabuki. SnS: Where do you volunteer? Noelle: I haven’t been able to volunteer as much as I’d like, which is one of the reasons I’ll be cutting back on art shows, so I can spend more time trying to make a difference in people’s lives. There are many great organizations I support. Some of my favorites are Sea Shepherd, Mercy for Animals, and World Wildlife Fund. I also donate to animal shelters that hold fundraising auctions. For the last couple of years, I’ve volunteered as a mission assistant for Angel Flight West. I hope to continue as an assistant, and eventually as a pilot. Angel Flight West is a non-profit that flies people for free, to medical appointments when they either can’t drive themselves or afford air fare. So, say that you need to travel from Spokane to Seattle 3x per week for medical help. Angel Flight West would take you there. All the pilots volunteer their time, money, and aircraft. A friend of mine, Jim, volunteers with them and he introduced me to it. SnS: So do you have a pilot’s license? Noelle: Not yet. I started learning last year, but I’m moving from Oregon to Spokane right now, so it’s on hold. Sadly, I’m moving away from my friend Jim, who’s been kind enough to allow me to use his plane without charge. I’d like to pursue lessons again once I’m settled in Spokane, but pilot training can be expensive, so we’ll see. I’ve been painting commissions of people’s planes and saving those earnings for flight school. In the meantime, I’m finishing my ground school training. In fact, learning to fly is what got me into painting airplanes. It was a new and refreshing challenge. I have so much fun painting something more technical versus my usual animals. The first ones I painted, didn’t have any pilots, but I felt they were missing some life. So I painted Pilot Dog and once I did, the paintings with him got a really wonderful, positive response. In fact, my two main paintings with Pilot Dog sold. I have one original left, of Pilot Dog in a Pitts Biplane. I’ve also done a few paintings exchanging the client’s dog as the pilot. So one thing lead to another, and it’s been fun and exciting. SnS: Do you have a favorite painting? Noelle: I tend to favor newer pieces, because I’m excited about them, like my Pilot Dog series. I also like the joy that dogs exhibit in every day life, so that is a recurring theme. We can learn a lot about being present, and joyful, from dogs. Still, it’s hard to choose a favorite painting. They all have different feels and themes that touch me in different ways. One of my all time favorites is “Rocks Gazing at Moon” (pictured above), because I like to think of everything on earth as having some sort of unseen spirit or energy. SnS: Which artists (past or present) do you admire? Noelle: Stylistically speaking, my favorite artists are Kandinsky, Miro, Picasso, Modigliani, Klimt, Dr. Seuss, Gary Larson, and many, many more. Larson’s often dry, outrageous, scientific / intellectual humor was a big influence on me growing up. SnS: So where do you find inspiration for your creations? Noelle: People often ask what inspires me, but in my mind that’s not the same question as how do I come up with ideas, so I’ll answer both. I am inspired by two things. The first is, being in the act of creating makes me feel alive, calm, and at peace with the universe in a deep meditative way. The second reason I’m inspired to create is that it brings humor and joy to people’s everyday lives. In a world with so much darkness and pain, to bring a smile to someone’s mind / face, bringing them joy for a moment, is the most meaningful gift I can give with my talents. Both of my parents worked in Mental Health fields. My mother was a social worker for abused children, and I was raised with the understanding that it is our duty as humans to do what we can to help others, and make the world better. And no way is too small. A smile from a stranger on the street has resulted in my going home and creating a painting that in turn, brought joy to many others. I think people often underestimate what they can do to make the world more joyful. My art is hanging in a few healing / health centers. Some of my work is here in Spokane. Some is in the Children’s Chemo room at Renown Health in Reno, NV, a children’s cancer hospital in Brazil, and other places. To me that is the most amazing, fulfilling thing I’ve done with my art. To give people in pain something to cheer them up. I would love more than anything, to do more art for healing institutions. How I get my ideas: Most of my best ideas come from clearing my thoughts and sketching without any idea in mind. Once I start drawing, an idea or design will appear to me, and then I will consciously move forward with it. About a third of the time, I will draw with an idea in mind, such as dog, cat, airplane, or Airstream. Beyond that, seeing my dog play in the snow trying to catch snowballs in her mouth, inspires me. As does learning how to fly planes, give me conscious ideas for plane paintings. SnS: Your Pilot Dog character seems to really get around. If you could travel anywhere in the world, where would you go? Noelle: That is hard to answer. I want to go everywhere. I like warm and tropical in the winter. I also like outdoor adventures. I found an on-line discussion forum for the sailing community and was able to match up with a couple of people who needed a crew. We met via Skype, exchanged references, and I ended up working two voyages with two different, very small, crews. It was a great experience both times. Of course, Pilot Dog likes to travel too, and can fly himself anywhere. I’m hoping to make a kids book starring Pilot Dog next year. SnS: Oh, I hope you do! I first saw you at ArtFest here in Spokane. Do you travel a lot? Noelle: Yes, I’ve been doing art shows full time for 14 years, and that requires a lot of travel. I’ve been doing about 33 shows annually, split between local and out of town. But, I’m excited to be moving to Spokane at the beginning of the new year, and hope to focus more on selling art in my community, on-line, and travel less. That will also give me more time to volunteer and work in the community. I’d really like to volunteer with youth, and spend time with elderly people who may not have anyone visiting or helping them. Those two areas are very close to my heart. Animal welfare is, as well, but luckily I’ve already been able to help out a lot with that, by donating animal art to auctions, and donating a percentage of sales to various organizations. SnS: That’s great! So here’s a silly question. Once you are settled into your new home, if you could invite ANY three people (living or dead) to a dinner party, who would you invite and why? Noelle: Oh that’s tough! I’d invite Jesus, because I think he was cool even though I’m not religious. Theodor Geisel (more popularly known as Dr. Seuss), and the Dalai Llama. SnS: Now that, would be a fun and fascinating group! Thank you, Noelle, for sharing your time and talent with us, and welcome to Spokane! If you’d like to see or purchase some of Noelle’s art, visit her website NoelleDass.com. She has originals, giftable reproductions, T-shirts and more. **SquidandSquirrel readers are being given a special $15 off coupon code to use online, with no minimum. Just use code Squid15. Meet Tom Norton, People’s Choice winner at “Origins of Fear” exhibit. A true Spokanite, Tom grew up near the Garland district and says his love of music started in first grade, when the nuns at St. Xavier asked him to play piano for them. He continued playing at G Prep where occasionally his talent bought him some leeway, getting him out of class, and sometimes out of trouble! Always looking for the silver lining in things, Tom is still a bit of a perfectionist when it comes to his paintings. He believes that “Less is more” and admits to having painted over finished works when he felt that he’d tweaked them too much. As a writer, I understand that need to edit, re-do, edit again. I believe it is a condition endemic to the artists heart. Now celebrating seven years of sobriety, (WTG Tom!!!) this self proclaimed “reformed” bad boy is putting his talent for art and music to good use and in turn, making the world a better place. Keep reading to learn more about this fun and fascinating man. Q: Congratulations! You are the People’s Choice winner at the Little Dog Art Gallery’s “Origins of Fear” exhibit. Your piece, “Room 208 / Mother Please” is apparently creepy and haunting enough to have chilled the most spines. Please tell us what inspired it? Did you make it specifically for this show or had you finished it prior to the open call? A: Thank you! “Room 208” began as a quick sketch of a face, which I immediately didn’t care for :), so I painted black hair over the face. A straight jacket came to mind – don’t know why, and so it “began”. I began to think about my mom and her many, many dark years suffering from bi-polar depression. She was treated for this throughout her life, before anti-depressants and therapies evolved into what they are these days. I grew up watching her, not understanding what was happening – only being told to be quiet and kind to her – that she was “ill” and that we needed to do everything we could to make her days easier. Shock treatments, massive amounts of prescribed drugs, and the fallout from these things: nightmares, isolation, realizing that our family was not like the happy families on television – it was tough. Mom could be extremely manic and in no control of what was going on inside herself one day, and then sweet, gentle and wonderful the next, so these thoughts had some things to do with this painting. It’s not about my mom though. It’s about isolation, and controlled environments. About being kept away from the world. And no, I did not create it for this exhibit. It was completed before the call, and just seemed to be a good fit to me as an entry. I wrote a quick story to go along with the painting . . .
Q: Is this a genre you usually work in, or was this a step outside of your comfort zone? Also, what would you call your style of art? A: This was way outside my comfort zone or normal work genre. I don’t have, nor do I want a specific style of art. I go day by day, and ideas come to me, or scribbles turn into something. Most of my work ends up being “lighter”, more whimsical, more fun. Some of my art is dark though, and it’s rare that I show it, or even finish it in one pass. One day I’d like to do an exhibit of my darker art, but I fear that I may be locked up if I do! Q: How long did it take you to finish this piece? What materials did you use? A: I started this one at Mt. Baker Blues Festival. I was performing there with The Bobby Patterson Band. I play keyboards. I finished it a few weeks later, so I guess about a month to complete. It was done with acrylics and charcoal on wood panel. Q: Did any of the other pieces at the exhibit creep you out? A: Yes, I don’t like spiders, but the spider mobile fascinated me. I stared at it for a long time. They were just so beautiful I was mesmerized. Q: How long have you been painting, and how did you learn your craft? A: I’ve loved art since I was a young boy. Always doodling, always amazed by the artists in this world. I am primarily self-taught. I was invited to take some art classes at GU when I was in high school. I wish I would have studied art and learned more techniques back then, but I decided to be a rock star instead 🙂 and the music business consumed me for a long time. My art took a back seat, and it wasn’t until 2009 that I revisited that passion. A: Everything inspires me. I love galleries. I love people. I love dogs. I didn’t paint for over 20 years. Then I retired, sort of. Now I can’t stop getting inspired! Q: Do you make a living with your art or are you moonlighting from a more “muggle-ish” job? A: No, I don’t make a living with my art. I sell a few pieces here and there. I’m supposedly retired, but my music and art keep me very focused, very busy. I don’t want to be that old man who sits in a chair and looks out the window. Q: After checking your facebook page, it looks like you are both a Seahawks fan and an animal lover. Is that correct? A: That’s right. I am a long time Seahawks fan! I love Seattle. I miss living there. And I love animals. Football players are animals too ;). I love my two dogs, Max and Sophie. I don’t care much for cats. They don’t like me. Q: If you could travel to any place / time for your art, where would you go and why? A: France and Italy in the present. I love the new emerging art, and I love the old masters. I was in Europe last March. Paris is amazing. I could spend a lot of time there, painting, learning, eating. . .
Q:Who are some of your favorite artists, in any genre, and how have they affected your artistic expression? A: Dali, Picasso, Gahan Wilson, Da Vinci, Rembrandt, Pollock, David Choe, Os Gemeos, andy and all true graffiti artists. The radical differences in these artist and styles of art have “infected me” for many years. Q: Do you have any causes / charities you support that you’d like to share? A: I’m currently supporting getting Trump to go away and never be seen again. (D’oh!) And I feed the homeless sometimes. I support 2nd Harvest and Salvation Army along with a few others, but I need to do more to truly support those in need. I need to make the time to do that. Q: Where can we go next to see or hear more of your work? A: I’m exhibiting at Left Bank Wine Bar again for the month of November. I love that place. I sell art there! People come, drink wind and beer, and sometimes they see and like my art! I like showing in wine bars. I don’t drink anymore, but I enjoy seeing people drink and have fun and then buy my art. If you are not into wine bars but want to check out Tom’s work, you can visit his website Tom Norton Art . Or, if you are more interested in music, you can find him most Sundays playing with Voodoo Church at Cheap Shots. Q: So final and possibly most telling question. Tom, do you prefer Star Trek, Star Wars, or Dancing with the Stars? A: I prefer Star Trek. I enjoy the cheesy first episodes, the evolution of Spock, and its more optimistic view. I can’t say I’m surprised that Tom preferred Star Trek. He is constantly looking for the good in life, in people, in art and music. His kindness and wit made this interview completely enjoyable. Of course none of this would have been possible if it weren’t for Kay West at the the Little Dog Art Gallery and her chosen curator for the “Origins of Fear” exhibit, Megan Holden. A fine line illustrator, graphic designer, and jewelry maker, I got to sit down with Megan a few days ago and ask her about herself and the exhibit. Unsure about what to expect upon meeting her, the first thing I noticed about Ms. Holden, beyond her gorgeous auburn hair, was her awesome Led Zeppelin shirt and amazingly detailed fingernails painted with skeleton parts on a black back ground. Pretty much everything about her oozed quiet confidence and fun loving friendliness. I was instantly put at ease, and drawn in. Pun not intended, Ms. Holden’s drawings are intensely detailed, lively and full of motion, it is easy to get lost in them. A feast for the eyes, and her jewelry is just as lovely. You can see for yourself by visiting her facebook art page Poseidon’s Consort or her jewelry page JewelryDesignedByMegan. When I asked her how long she’d been a curator, the surprise answer was this had been her first foray into curating! Apparently, she’s known Kay for a while, having met at the New Moon Art Gallery , when they both had pieces there. Kay asked her to curate the show and, despite never having done it before, Megan jumped in with both feet and created an amazing exhibit. She had two criteria for choosing pieces from the many entries the open call brought in: 1) Did the artist follow submission guidelines? No cutting corners or dodging procedure allowed. 2) Did the piece generate a feeling of fear or a perception of danger in some way? Did it dredge up memories of past fear? I think we can all agree, we’ve all had some sort of fear response to unusual situations, shocking surprises, and those things that go bump in the night, right? Thankfully, Ms. Holden wasn’t afraid of the unknown and agreed to curate the “Origins of Fear”. Once selected, the artists works spent a month in the Little Dog being admired and voted on. Tom’s “Room 208 / Mother Please” ended up being the most popular / creepy. Second place went to a lovely gal previously interviewed for this blog, Kim Long! Her submission (below) is called “Surrender the Heart” or “Spirit of the Birch”. Congratulations to Tom and Kim for winning the most votes, and to Megan for organizing a terrific exhibit! An interview with the People’s Choice winner of the “Origins of Fear” exhibit at the Little Dog Art Gallery. There are still 3 days left to vote. If you haven’t stopped by to experience the chilling art work or to cast your ballot yet, you’d better run down there. RUN, RUN FOR YOUR LIFE! Then, stay tuned guys and ghouls, to find out who caused a shiver to run up the collective spines of all those visiting the gallery this month, and learn just how twisted they really are! Muahahahahahahahaha! Outside the PNW, my tre”Maine”dous trip through Kennebunkport’s art galleries. It started out as a work training trip for my mechanically inclined hubby but, thanks to a serendipitous find of cheap plane tickets, I was able to accompany him to Kennebunkport, Maine. We treated the trip like a belated 25th anniversary adventure. At night we both enjoyed traipsing through the various gift shops, and savoring the local food specialties, especially the lobster! Or as the folks of Maine would say, “lobstah”. During the day my husband went to work while I explored the towns plethora of art galleries, so of course I decided to share a few of my favorites here. Click on the links to see what I’m so excited about! One of the first places I found was located at 8 Western Ave. Deborah Randall Fine Art is owned and operated by its namesake. Even in the few moments I got to spend speaking with Deborah, I can tell you she exudes strength and passion in person, as well as in her art. The front of the gallery displays her amazing Maine seascapes in large, small, and even smaller amuse bouche sizes. Water, clouds, and earth in every shade capture the many moods of the surrounding area in a majestic and magical style. The back of the gallery doubles as her studio / office, but also houses her more whimsical enamels. Smaller 5″ x 7″ paintings, these bold offerings are fun and thought provoking little petit fours of artistic expression. **I fell in love with two pieces “Big Red Sky” and one of the chicken enamels. Love! The Maine Art Gallery at 14 Western Ave. was my next stop. Filled with paintings and sculptures from many incredible artists. I was blown away by the eclectic nature of the works offered. Paintings of every discipline graced the walls, while sculptures both wood and metal filled up any blank spaces. In fact the metal sculptures continued to the outside parking lot as wind catching whirligigs. Gallery Director, Amy Lewia, kindly answered my questions with a smiling enthusiasm that drew me in and kept me browsing. From ethereal to earthy there was something to appeal to every taste. **My favorite sculpture was a perfect sphere, nearly as tall as me, made out of rusty old horse shoes. Amazing! David P. Fouts at 31 Ocean Ave. The Landmark gallery was painting a seascape featuring a tall ship when I walked through the door. That didn’t stop him from getting up to shake my hand and inquire about my day. Personable and talented, his work as well as that of many other regional artists, both painters and sculptors, is displayed in this lovely renovated firehouse. Sea birds, ships, boats, beaches, waves and sand, the offerings in this gallery are representative of all things nautical and lovely. A total treat for the eyes, the styles ranging from dreamily impressionistic to amazingly life like are well worth looking into. **David P. Fouts’ painting of St. Ann’s (sorry I lost the title!) and David Tutwiler’s “Thunder of the Iron Horse” stood out to me. Gorgeous! Northlight Gallery , 33 Ocean Ave. is right next door to The Landmark and one of the owners, Harry Thompson, was jamming out to 60’s music when I stepped in. I had to admit, the music drew me in and put me in the mood for a bit of funky art. I wasn’t disappointed. This gallery displays artists of all kinds. Paintings, photos, and sculptures don’t compete for space as much as share it and compliment each other. Harry himself, besides being a talented artist, is a warm and lively host / curator with a quick smile and great sense of humor. Creative to the core, he asked me to compare and contrast east coast (Maine) artists against west coast (Washington) artists. Well Harry, that topic is way to broad for this old broad (jet lag being what it is) so instead I’ll give you all the highly generalized short version: Kennebunkport vs. Spokane. The artists I enjoyed in Kennebunkport, despite their wildly different styles, all seemed to have a couple things in common: a sense of life and inevitability. Like the ocean they live by, the waves against the shore, ever changing, ever the same, their work can be counted upon to create feelings of wonder and awe. Motion and mystery. The artists I know and love in Spokane share a different aesthetic. Evergreen forests and animals inform much of their work. The wildness of the ocean is traded for the ruggedness of mountains and river valleys. Spokane artists tend to honor native traditions, question authority / reality, and highlight nature’s bounty, and wrath. Their work invokes appreciation of and respect for inland nature, as well as a sense of mirthful irony. **So many great artists to choose from here, I have to say I was struck by Stephen Maka’s folded photographs, Harry Thompson’s colorful dorys, and Jack Standish’s clean, minimalist paintings. Overwhelmingly cool! My final visit ended up being the most amazing. Little did I know when I walked into the W. Robert Paine Gallery who I was meeting or how lucky I was to do so. The screen door squeaked when I opened it and I was greeted by the sound of small dogs barking. I was looking at two 8″ x 8″ paintings hanging just inside the doorway; waiting for my ankles to be attacked, when a door opened and a gentle voice shushed the enthusiastic pups. A tall, elderly gentleman approached me and apologized for the noise. I joked about his “vicious guard dogs” and inquired about a familiar painting above his left shoulder showing George and Barbara Bush sitting with their dog. That one question started a forty-five minute conversation that would keep me smiling for days. Turns out, the elderly gentleman was none other than the artist W. Robert Paine. Ninety three years old and still as sharp as a tack, Mr. Paine shared many lovely memories about his paintings, his family, and his friendships. Incredibly charming and elegant, he regaled me with stories of serving his country, going to art school with renowned American artist Norman Rockwell, creating those iconic Palmolive dish soap ads, and hanging out with both Presidents Bush and their families. Agog at his history, I asked him if he’d ever considered writing an auto-biography. I should have known better. Mr. Paine strode across his studio and picked a book off his coffee table. Together we leafed through it as he pointed out past work he’d done and people he’d known. The book is out of print now, but as I promised him, I tracked one down. It’s used, but I’m hoping if I send it to him, he’ll sign it for me. W. Robert Paine has lead an amazing life. I am honored to have gotten to spend time with him, and wish him all the best. I also wish I lived closer so that I could visit this amazing and kind man again. God bless you Bob! **Favorite painting at W. Robert Paine’s house? “God Bless America.” Great story attached to that one. Thanks again for sharing it with me sir. **A quick mention** On our way to catch our return flight home, the hubby and I stopped by the Franciscan Guest House and the adjoining grounds of the St. Anthony Monastery and Shrines. If you appreciate Catholic / religious icons and statuary, or just wish to enjoy a walk through beautiful garden-like areas, drop by. Clancie Pleasants – Telling Life’s Stories With Paintings. Artist Clancie Pleasants has been creating art her whole life. Always moving, always learning, this Aquarian, former Montessori teacher does more in a week than most folks do in three, and she loves what she does. I got to speak with Clancie after she’d spent the last few days painting originals for an upcoming show, going to meetings at her local community center, doing some live model painting with friends, and picking elderberries with her brother. Kindhearted, adventurous, relaxed, and possessing a positive “can do” attitude, she is a sweet whirlwind of a woman. Keep reading to learn more about this fantastic artist. Q: What first inspired your love of art; your want to create? A: As a child I was always encouraged to do art, read, write, anything creative. I was a country child. I had 2 older sisters and a younger brother. We lived on a large cattle farm/ranch in Northern California and spent a lot of our time doing whatever we wanted, we were self entertained. We had horses, dogs, cats, chickens, but not a lot of children, other than each other, to play with. We created our own play and had the materials at hand to do whatever we wanted. A lot of my love of nature comes from this experience. I was encouraged to read classical literature, draw, paint, make baskets, build forts, and work with clay. I have been doing this for almost 70 years now. Q: Have you always been an artist, or have you had a 9 – 5 day job? If so, was there a defining moment, when you decided to make a go of it as an artist? 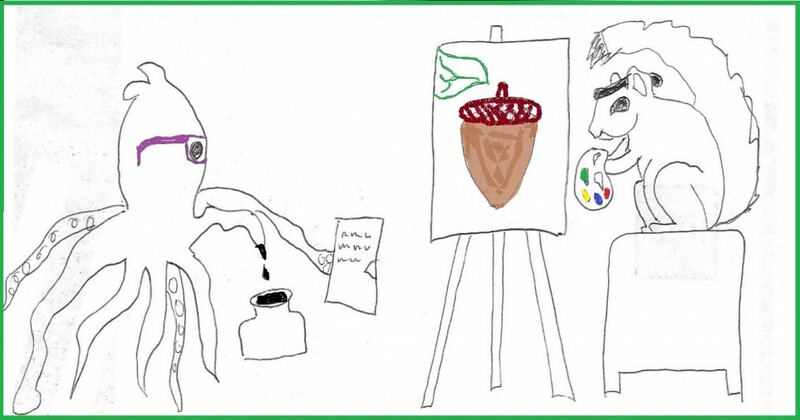 A: I have always been an artist. I didn’t realize that I was until it was all that I wanted to do. I would do it 24/7 if I could. I had my own Montessori School for 24 years on our acreage, on Hoodoo Mountain, out of Blanchard Idaho. It was a very creative school, and, of course, full of art. I ran it three days a week and did art the other four, while raising and homeschooling my own children. It was an artful way of living. I have never created art with the idea of making a living at it. It was just something I had to do, a driving force. It is hard to make a living doing fine art, especially as a woman. It is just something I incorporated into my life and everything that I do. If I make money doing it so much the better. But, selling is not the driving force. That being said, I have been showing and selling art for over 30 years. I have been in numerous galleries nationally. Locally, I’ve had pieces in The Art Spirit Gallery and various other galleries. I now show at Studio 107 regularly, in downtown Coeur d’Alene Idaho. Q: I’ve seen your paintings on canvas, boxes, clocks, etc. What’s the craziest thing you’ve ever painted on or do you wish to paint on? A: Probably when I helped a friend paint a VW van in the 60’s. A fun project, as was the time a fun time. Also, I built an active art fence and painted part of that at a funky place where I was living while in college. Sonoma County was a fun place to be during my college years. Lots going on. Lots of art, lots of music, lots of experimenting. We used to hear Dave Brubeck, Charlie Musselwhite, Miles Davis, just to mention a few, at a little place in my college town. The campus was always having music outside and you could plop yourself on the lawn, do your art, study and listen. Sonoma State University was a very small college at the time. Our teachers were, for the most part, really creative, as they were artists and writers and doing it all themselves. It was such a creative place to be. Q: Do you have a “process”? (Do you drink tea and dance the Macarena before painting?) What do you do to get in the mood to create? What inspires you? A: Everything inspires me except for the negative forces at work. Sometime even the negative inspires me as I like to find the light in the dark. I live in the middle of my medium and so never have to go far to have it available. I have a beautiful studio. It has a bathroom and closet in the way back. And then one big room with two hanging lofts for paintings on either side. My home is also my studio where my art has taken over more than just one room. Our wood working shop, where my husband frames some of my work, is available to me as well as all the saws, sanders etc. View from inside Clancie’s studio. It is lovely. My process is to just do it. That is what I tell others when they ask me about this. Don’t think about it….just do it. Don’t think about what you have to do to get ready to do it….JUST DO IT. But, of course I think about what I want to do, lots. I just have to calm myself down or the daily chores of living would never get done. But, while doing those chores, I am always thinking about what I will do next or what I am currently working on. I have unfinished paintings hanging from the rafters of our living/kitchen area, just to study while I am doing other things. My husband is a saint, did I mention that yet?! Q: Why do you say your husband is a saint? A: Because he has always supported me in my endeavors. He helps wherever he can, and never expected me to play the super traditional housewife role where everything is kept spotless and supper is on the table by 6:00. He’s happy with who I am. Q: From the pieces I’ve seen in gallery, and on your website, your creations seem both poignant and playful. How would you describe your style? Q: Do you have a favorite artist (from any genre) & how might they have influenced you / your style? A: Virginia Woolf, because “A Room of One’s Own” is terribly important. Picasso, because he lived it ALL the time. Of course he had many women supporting him and doing all the other things. One can dream. Truthfully, too many: Van Gogh, Alice Neel, Klimt, Kollowitz, Diebenkorn, etc. Q: Your website mentions you have a BA in English Lit. as well as art. What type of writing do you do? Does your writing ever inspire your painting or vice verse? A: Yes both inspire each other. I have a book of fiction almost finished and ideas for two more. The 70’s are a good time to work on those, don’t you think?! I also write poetry, essays and fiction. Creative writing is terribly important to me. I love reading and writing it. Q: You mentioned you’ve been working on writing a book. Can you tell me what it’s about? A: The first book is a piece of fiction which takes place in Idaho. I have lived in Idaho for almost 40 years. In the second piece I’d like to tell the story about my grandparents and how they lived. My grandfather was a 3rd generation farmer / rancher in Norther California. My grandmother was a new teacher in the one room, country, Pleasants Valley School. They got engaged and she returned to Southern California for the summer. They wrote letters back and forth. I have all of my grandfather’s letters to my grandmother tucked away in a shoe box. I do not have her letters to him. So I would like to write the letters myself and put the whole thing together with other information I have. It is a sweet story for the most part and it would be fun to write it with the grandfather I never knew. The third book would be about the other side of my family. I am a 5th generation Californian on both sides, and there are many stories that no one has written about. I guess I feel pulled to do some of that to keep it alive. Q: What advice would you give to new artists just starting out? A: Take some classes and find out what you love. Take more classes, read a lot of art books and find out who you love. Then, DO IT…just do it. Traditional study, self taught learning, whatever, study those artists who are doing what you love. I have lots of art books that I binge on as well, and I check out art books from the local libraries to recharge. But, when the schooling process is finished it is good for an artist to isolate and do her own thing. I have spent years finding my own voice and doing my own thing. But, I am still learning from everyone I know and paint with, when I get together with other artists. Also from reading, studying, learning about different artists, relearning about different artists. Also, don’t listen to negative people but listen to good constructive feedback. Then, isolate, and listen, mostly to your inner voice. Q: If you could travel ANYWHERE (time or place), where would you go and why? Who would you bring with you? A: Mostly, I have found that traveling to the natural, untouched by man, places, are where I find solitude enough to do my creating. There and home. We live on Hoodoo Mountain out of Blanchard in North Idaho and have acreage. It is wild and natural and peaceful. It is on the edge of the wilderness and we have all kinds of wildlife around. I would still love to go to the European continent, in the 60’s or before, live there for a year or more, to paint and write. I would love to travel to Africa and live there for a year or more, sometime in the 1920’s. I would always choose to take my two daughters, who also both do art, and my dear husband with me. Q: Are your daughters painters like you? A: Yes, both daughters paint and work with clay. They are both very creative. One is a Montessori teacher and the other one is an architect. They both are good writers as well. Q: Do you have any hobbies or causes you support? A: Educating people about the importance of art. Supplying children with the art education that they are not getting in school. I love sharing the art experience with children and adults. I run our community arts program out of our beautiful community center, in Blanchard Idaho. We run a free art program for children in the summer. We have adult classes throughout the year. We offer area seniors and teens scholarships to our classes, workshops, and sessions. I have been doing this for the past 10 years. I see this as my community service, my way to pay back for my good fortune in life. Camping and hiking and being with the family doing these things, is how we love to spend most summers. I am passionate about organic gardening and herbs, medicinal and otherwise. Coming Soon! An interview with artist Clancie Pleasants.